Designed to provide a step by step guide to successful application of the electrical installation calculations required in day to day electrical engineering practice, the Electrical Installation Calculations series has proved an invaluable reference for over forty years, for both Foundation and Modern Apprentices, and professional electrical installation engineers alike. Now in its sixth edition, Volume 2 has been fully updated to meet the requirements of the 2330 Level 3 Certificate in Electrotechnical Technology from City & Guilds, and will also prove a vital purchase for students of Level 3 NVQs in Electrotechnical Services. 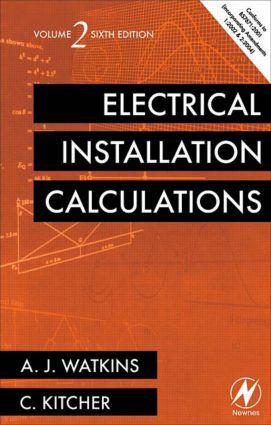 Essential calculations, which may not necessarily feature as part of the requirements of these syllabi, are retained for reference by professional electrical installation engineers based in industry. The new edition also brings content in line with the latest edition of the Wiring Regulations BS 7671:2001 (incorporating Amendments 1:2002 & 2:2004), with material cross-referenced to the Wiring Regulations throughout. New learning features are now incorporated into the text. In particular, alongside the traditional long method of calculation, new calculator methods are presented to demonstrate this alternative, more simplified methodology, now often in use. Key terms are explained in a glossary section and worked examples and exercises are included throughout to maximise accessibility of the material for the reader. A complete answer section is included at the back of the book to enable readers to check their understanding of the calculations presented.